In addition to solar for farms, we’re also keenly interested in developing community solar farms. Community solar farms are a great way to bring solar to people that do not own their homes or have poor solar sites. 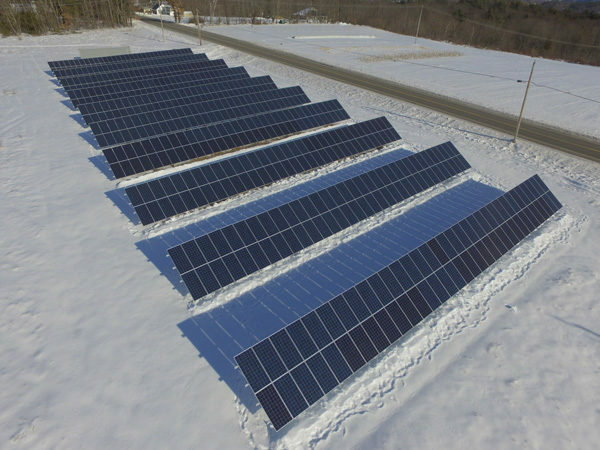 We’ve built a number of solar farms in Maine and are actively looking for additional landowners in Maine and New Hampshire to help lead the solar revolution and offer up that approximately anywhere from 1/4 acre to 5 acres of land that just sits in the sun year after year. The way it works for users: you invest as a member in a solar farm and get a % of the farm’s production automatically applied to your electric bill, just as if the solar was on your rooftop! For landowners: you lease up a parcel of land, we do all the heavy-lifting developing the legal framework and then building the farm, and you get a yearly payment for hosting. Instead of growing hay or just weeds, why not lease a parcel of land to a community solar farm association and help make the energy transition happen in our region? We are interested in sites that are already cleared and are close to existing power lines.